Travel in Spring or Autumn and due to the earlier sunset you'll be able to enjoy a whole cruise of Paris lit up at night. We are comparing Seine River Dinner Cruise and Cabaret Show Prices from leading ticket suppliers and Try to find you Cheap tickets prices on the market. The Marina de Paris is a glamorous boat that travels up and down the River Seine allowing passengers to see the sights of Paris lit up at night whilst enjoying a gourmet 3 course dinner. The after-dinner entertainment takes place at Lido de Paris on the iconic Champs-Élysées. The cabaret and burlesque show is Parisian entertainment at its very best with a magical atmosphere and exotic dancers. A romantic night out that will stay with you for a lifetime. The perfect way to celebrate a birthday, anniversary, or other occasion. Make sure you have your glad rags with you - There's a formal dress code with men required to wear a suit and tie and women expected to wear cocktail dresses. Your Experience With Seine River Dinner Cruise and Cabaret Show? Board the elegant Marina de Paris boat at the quay and settle down to enjoy a 3 course meal at your individual table by the window as you float past the iconic sights of Paris lit up in all their glory at night. Admire the Eiffel Tower, The Louvre, Notre Dam and so much more as you cruise under the floodlit bridges and soak up the romantic atmosphere with live music onboard and a delicious gourmet dinner. After the dinner cruise, which slate 1.15 hours, you'll be transported by minibus to the iconic and beautiful Champs-Élysées where you'll find the Lido de Paris Cabaret venue. There, you'll enjoy a glass of champagne whilst watching the typical Parisian entertainment in the form of cabaret and burlesque show. At the end of the evening you'll be transported back to your hotel either via minibus or taxi. What Seine River Dinner Cruise and Cabaret Show Includes? 1.15 hour sightseeing river cruise with 3 course dinner. Lido de Paris Cabaret and Burlesque show with glass of champagne. Travelers Reviews about Seine River Dinner Cruise and Cabaret Show? Travellers talking about this cruise on Get Your Guide and Trip Advisor are, for the most part, very impressed with their evening in Paris. 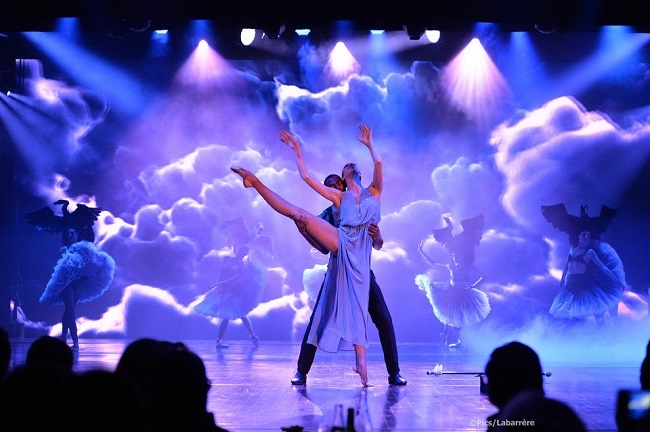 People describe it as "Super" and "Highly Recommended" going into more details by saying "Was a lovely cruise highly recommended to soak in the Paris atmosphere on the seine for dinner then a fantastic show afterwards at the lido." and "Super organized, food very tasty, and Lido show absolutely worth seeing". Some criticisms come from expensive drinks onboard the boat and some people getting poor seats for the show but generally people recommend this tour and say it's a definite night to remember! E-tickets and printed tickets are accepted at the ticket office before boarding. Dress to impress! There's a formal dress code with men required to wear a suite and tie and women expected to wear cocktail dresses. You'll meet the boat close to the Musée d’Orsay. Duration: 3-6 hours depending if you stay on for the after-cruise party.